A Thing for Roses: Back to My Thriftin Ways! Back to My Thriftin Ways! 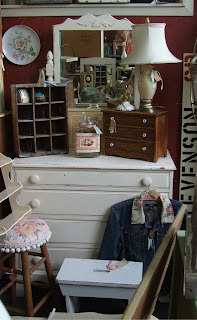 I started the weekend thrifting early on Thursday by checking out craigslist where I found a cute old dresser for a steal. On Friday I hit a few neighborhood garage sales and while I didn't find a ton of stuff, I did find some treasures. Here's a picture of what I found plus the craigslist dresser. I thought the old sign was pretty cool even though it is on the extreme side of shabby. My heart raced when I saw the wallpaper glove box which also has some condition issues, but I don't mind. It was my thriftiest find of the day at a whoppin .10. 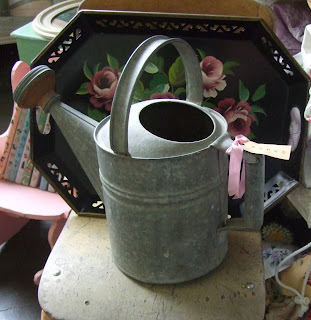 The silver bud vases are very sweet and I got them and the pink roses painting at the same sale. I have added the painting to my collection in my bedroom and it fits in very nicely. Last thing I found was the vintage red doll case, again, not perfect condition, but okay. 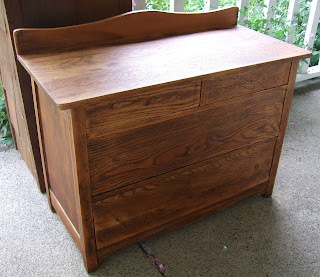 I spent some time lamenting over what to do with the dresser. Keep as is, rustic, paint it a shabby white? After talking to Joy, I decided not to paint it. I had already given it a good sanding when I talked to her so then I just went at it with some good ol tung oil and I think it turned out pretty good. Hardly took any time at all (much faster than painting) and I am really happy with the results. Just needs the knobs added and it's good to go. Also on Friday I found this dresser/mirror combo at another neighborhood sale. 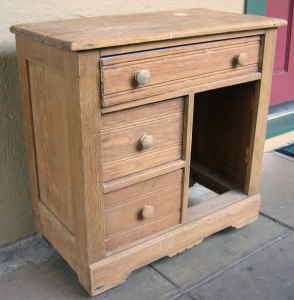 All it needed was a little fix on the drawer and some distressing and it was ready to take to Monticello on Saturday. On my way there I stopped at a couple more garage sales and found these cute things. 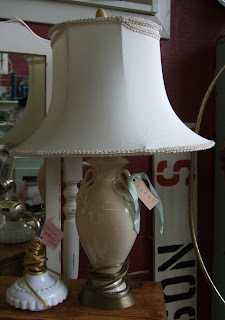 This adorable vintage lamp and shade. Click on pic to see the swans. Rustic barn wood shadow box. 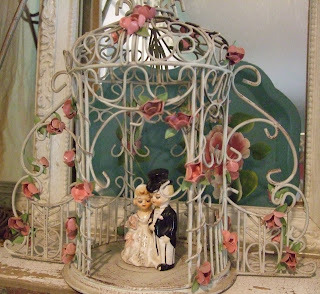 And this sweet rose gazebo. Not old, but perfect for my little wedding couple. I also found this old comode on craigslist. Big plans for this one. And this awesome old armoire which I am definitely keeping. It also needs work (shelves added inside), but I love it. 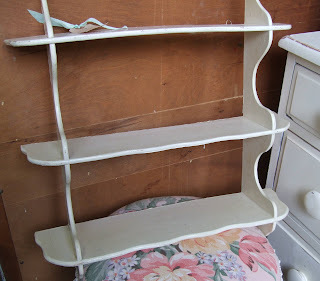 It is going in my front room to hold stuff. Oh yeah, did I mention that on Friday while trying to find some knobs in the garage I dropped a metal box on my foot and broke my big toe? Ouch, that really hurt. Second toe on the same foot to be broken. I guess I should be more careful, or, wear some shoes once in awhile. So, I pretty much did all of the above while hobbling around. Fun, right? Just goes to show you that not even a broken toe can stop this thriftin girl. Ough!! Don't you just hate it when that happens? Did you get a big cast? Reminds me of a joke... What do you do when your big toe falls off? Call a big tow truck!! Geez maybe I'm hotter than I thought.. Haven't found many treasures but I am sure trying. 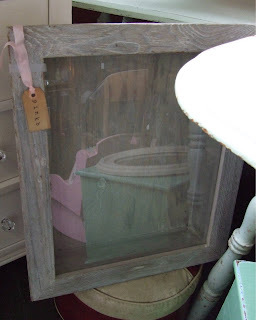 Love, Love, Love the shabby sign! It looks like you did pretty good this week-end! The gazebo is just perfect with your bride and groom. Love all your finds! And welcome back from Maui! We went there once, about 15 years ago. I'd say I am due for another visit! Wow, what treasures you found. But please let me know if you will be parting with that cool sign. 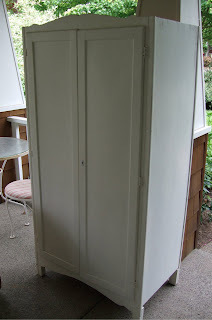 That commode will be cute...are you gonna add a little curtain? CUTE CUTE CUTE! You have been busy! I just gave you a blog award. Please go to my blog and check it out. love the swan lamp!!! !.....sorry about your toe..I feel your pain!!!! Good excuse to prop up your foot and eat icecream and cake!!!! and all the great furniture finds too. Thanks for stopping by! 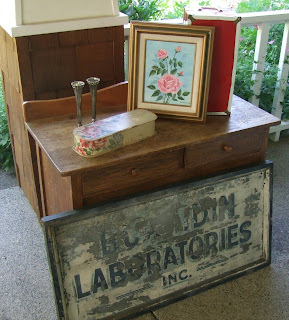 If you love good vintage junk, makeover projects, decorating ideas, and crafty goodness, then you've come to right place. Flea Market Dates Last Half of 2013 ANNOUNCED! FARM CHICKS EXTRAVAGANZA PART I!